XY-Shift compensation has been newly added to reinforce VC functionality, further improving image stabilization capabilities at any shooting distance from infinity to macro. Advancements in USD control software have also increased AF focusing speed and optimally fine-tuned for various framing conditions. Furthermore, a high standard of Moisture-Proof and Dust-Resistant Construction has been added to prevent intrusion of dust or water droplets. Highly durable, Fluorine Coating is applied to the top element surface and efficiently prevents condensation of moisture and repels smudge-causing substances. Meticulous craftsmanship is demonstrated in every detail of the exterior design of the newly transformed SP 90mm macro lens. The user can feel it in the exquisitely smooth texture of the metallic barrel. The lens features an optical construction of 14 elements in 11 groups, including one LD (Low Dispersion) and two XLD (eXtra Low Dispersion) glass elements that in consonance help to control lateral and on-axis chromatic aberrations at a very high level of performance. A Floating System works in tandem with the optical construction to efficiently compensate for inherent aberration changes subject to varying distances. Therefore, this lens ensures seamless and outstanding depictive capabilities across the entire shooting range - close or far. Flare or ghosting can be detrimental to a decisive shot. A combination of 2 types of coating - eBAND (Extended Bandwidth & Angular-Dependency) layered on top of BBAR (Broad-Band Anti-Reflection) - dramatically improves anti-reflection efficiency to deliver flawless, crystal clear images even against harsh beams of sunlight. 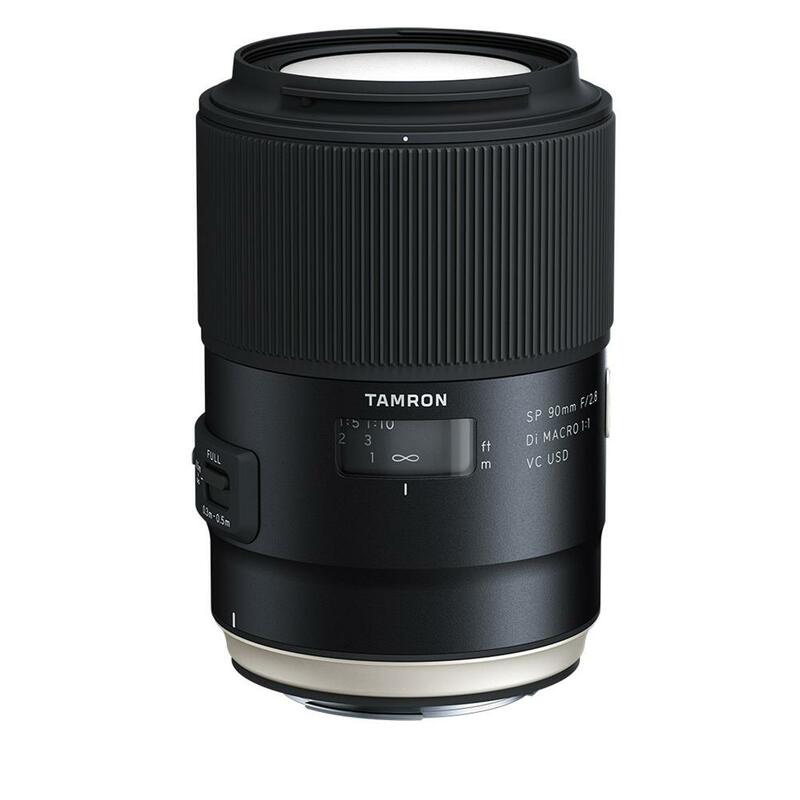 Tamron has maintained a reputable standard for generations of 90mm macro lens models - all the way from manual focus lenses to the current AF models - for their exceptional depictive quality with spectacular bokeh. We also set a high standard to keep pace with the upward migration of digital cameras with advanced technical features and high pixel density. We have now balanced these polar traits at a higher level: raising resolution performance to a new standard of sharp images, while rendering a soft and smooth transition in gradation of blur-effect in background objects. Optical simulations were thoroughly conducted to realize both well-tuned bokeh effects, while minimizing disturbance in dual-line smear of linear-shaped objects naturally blended into the overall bokeh effect. An accelerometer has been newly integrated into Tamron's highly accredited VC to compensate for shakes on the x-y plane. The accelerometer in unison with a gyro sensor detects and enables motion compensation for camera shakes for a maximum efficiency in image stabilization optimized for distance ranges from infinity to macro.